Many hunters today are making the mistake of trying to use mass produced pistol bullets in conjunction with a sabot to shoot in their muzzleloaders. At muzzleloader velocities and ranges, they fail to give desirable expansion and penetration. We found that our "dead-soft"™ jackets in our thinnest wall thickness (.025) produce rapid expansion and deep penetration with virtually no weight loss. In the past, many of our clients ordered bullets from us to use in their muzzleloaders and reported excellent results. After much additional research, we introduced a complete line of bullets for use in muzzleloaders. To insure expansion, even at extreme ranges, we highly recommend using hollow point bullets with the .025 jacket. Those that are hunting elk sized game and larger, we added heavier bullets with flat points and .035 jackets to resist initial expansion at muzzleloader velocities. We highly recommend the .452 260 gr x.025" HP with a black sabot for use in a 50 caliber. This is the highest re-order rate combo for muzzleloaders. Another favorite in a 50 Caliber is the .475 bullet with either a 265 gr or 300 gr .025 HP. The sabot for that combo is the baby blue Harvester and we have had very nice accuracy. The thinner fingers of the sabot easily release the bullet without altering flight and when it arrives it starts out a big .475 diameter. In the 54 caliber we have had excellent feedback with the .500 350 gr x .025" HP and the purple sabot. Please note: A lower case "c" appearing after the price indicates it is a custom order. The number after the "c" indicates the minimum number of boxes required to order. Watch closely as a Hawk bullet fully mushrooms. The boar looses its motoring skills followed by the area forward of the diaphragm filling with blood. Finally, the bullet's cutting path acts as a conduit for blood to be pumped out of the wound. Tracking when bullets preform like this is very easy. Use these bullets with the black sabots. The 260 grain bullet is proven and our most sold bullet for muzzle loading rifles. 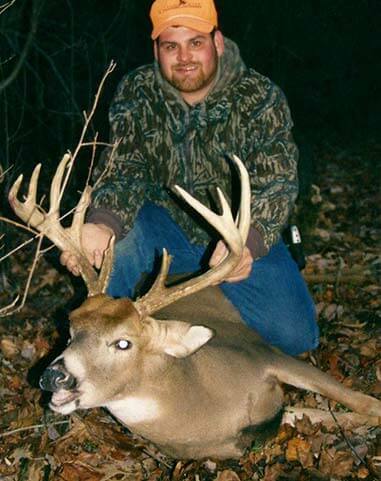 Above, Benny P. with one of his many large bucks taken during muzzle loader season with the Hawk 45 caliber 260 gr. X .025” jacketed hollow point fired from a 50 caliber in-line. 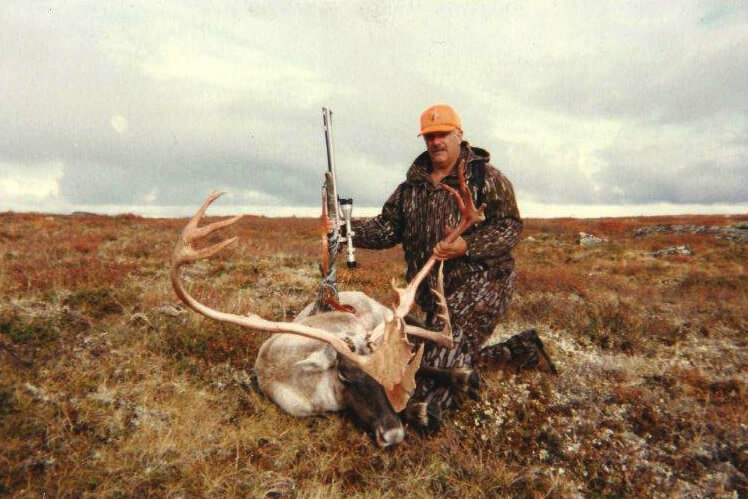 The same bullet as above takes a caribou. These bullets are used with the orange sabots from MMP in 50 caliber rifles. This allows someone to use bullets made for 45 caliber rifles in a muzzle loader. A 50 cal is far more versatile with this option giving choices commonly intended for the bigger game. These bullets are used with the baby blue sabots from Harvester. They are used in 50 caliber muzzle loading rifles. By far, our highest re-order rate is for the 265’s and 300’s.